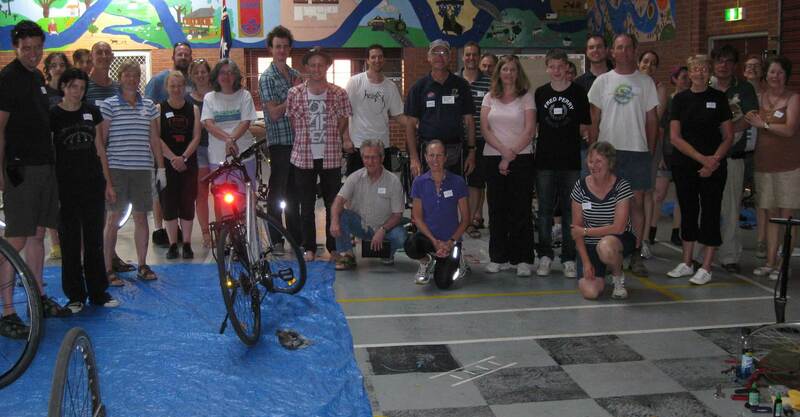 Our hands on bike maintenance workshop the other week was a big success. Thirty four people filled the Guildford Primary School gymnasium to hear from cycling enthusiast Mike Norman on keeping your bike in good shape. Mike covered the ABCD of bike maintenance, 90% of which you can do at home with only a few simple tools. Here’s a few things I picked up. ‘A’ stands for Air: Check your tyre pressure (it’s written on the side of the tyre). Make sure you have a set of tyre levers, a spare and a hand pump if you’re planning on riding a long way from home! Watch out for the introduced weed, Calthrop, the spines of which can cause punctures. ‘B’ stands for Brakes: Check both your brakes are working and ‘pinching’ together. You’ll need a set of allen keys to adjust the tension. ‘C’ stands for Chain: The most moving parts on the bike are in the chain. Make sure it’s clean, and it will save you a lot of work! Use an old paint brush or toothbrush to remove sand and crud from your chain. Pinch off built up stuff on your gears, including jockey wheels (the little ones that guide the chain). Then run the chain through a rag with a little degreaser (don’t spill onto your wheel bearings). Dry and remove excess from chain and apply bike chain lubricant. Wipe off excess. ‘D’ stands for D-lock: Make sure you have a good lock on your bike. This entry was posted in Peak Oil, Transport and tagged bicycle maintenance, Cycling, DIY, Guildford Primary, transportation. Bookmark the permalink.